What would an ideal Grade 7 & 8 program look like if there weren’t any logistical restrictions? It is challenging to clear your mind of the day-to-day reality, and allow yourself the mental freedom to re-design a learning community from the ground up. However, with the opening of our new building next fall, we are presented with the amazing potential to do just that. During the Greenwood Summer Institute, the Grade 7 & 8 Focus Group took on this task, challenging ourselves to design a Grade 7 & 8 program that is suited specifically to learners at this stage. Currently, our Grade 7 & 8 program operates on a high-school schedule with some modifications. The modifications allot more time for core subjects (English and math) as well as longer, simultaneous periods for the arts to allow for cross-curricular art experiences. Allows Grade 9-12 teachers with subject expertise to work with the Grade 7 & 8 students. In many ways, it is a win-win situation. However, young teenagers are neither the children they once were nor the adults they will eventually become. Some of their needs are different than those of the older students. It was these needs we tried to address when beginning our investigation. We began by researching and brainstorming about the unique needs of our Grade 7 & 8 students. What program characteristics would we want to include if we were designing a schedule solely for them? Increased daily break time at more regular intervals, with opportunity for physical activity every day. Reduced student movement between classes and subjects. Increased contact time with a smaller number of subject teachers. A more flexible schedule, allowing for longer blocks of time to work on some projects, and daily, shorter time blocks for others. A schedule that facilitated subject integration, such as math/science blocks coordinated by a team of teachers. Reduced class time dedicated to final assessments, with more emphasis placed on integrated culminating projects. After several iterations, we developed two proposed schedules that would meet these unique needs of our Grade 7 & 8 students, while still operating within the current timetable model at Greenwood. It may take time before a unique Grade 7 & 8 program is put into place. 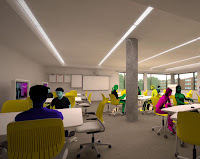 We will need to settle into our new building and get used to the new spaces and what they have to offer. However, it was an amazing mental exercise and a very exciting process. It is exhilarating to feel that there is a very real potential to affect positive, systemic change that will better serve all of our students. Our goal for the Greenwood Summer Institute was to immerse ourselves in Vernier technology in order to better understand how we can fully implement its use within the science department. Vernier manufactures interfaces, sensors and software for scientific data collection. Last year, several groups of students used the LabQuest 2 and various probes and sensors in their classes to collect authentic scientific data. We quickly realized the huge potential that this technology has to change our science classrooms, but we needed additional time to research applications, practice using the equipment and plan solid curriculum connections. The Summer Institute gave us this opportunity and proved to be an incredibly productive week. 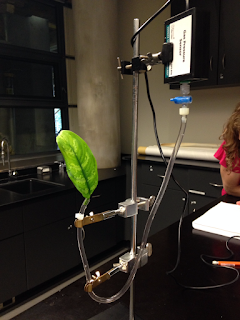 We began our investigation by exploring all of the basic and advanced functions of the LabQuest 2 interface, the Logger Pro data analysis software, and the Chrome Vernier Graphical Analysis App. We discovered numerous functions and useful tips that we are now able to share with both our students and fellow colleagues. From there, we aimed to identify course-specific activities in the Vernier resources that could be modified to suit our needs as a department. Based on the current curriculum and requests from teachers, we ran trial experiments to determine the feasibility of using these activities in our classes (see images). In all cases, the results were incredibly exciting. We now have a deeper understanding of how this technology allows students to collect rich data which aids in their understanding of the concepts being studied in class. The technology can provide enrichment opportunities for students and give teachers the tools to enable a more personalized program in terms of student-designed experiments. An introductory workshop was provided for the Science Department during our August Professional Development week. We will continue to offer training for teachers to learn and expand their skills during our designated IT workshops as part of our Wednesday morning Professional Development Model. Stay tuned for details of how this technology is being used in our classes in upcoming blog posts! The teachers at Greenwood strive to create a personalized program for students through the use of technology-rich resources (blended learning) and innovative programming. The development of forward-thinking approaches to education takes collaboration, time, and support for teachers. To achieve this goal, we recently launched our week-long Summer Institute. Developing a curriculum that integrates Grade 12 English (ENG4U) and AP English (ENG4UO) using a team-teaching approach within one learning space. Developing blended learning materials for Grade 11 Biology (SBI3U) to provide a student-centred learning approach. Designing the WWII unit in Grade 10 History (CHC2D) to integrate blended learning, community service, and experiential learning opportunities. 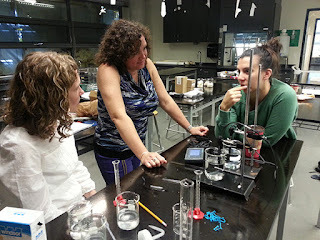 Generation of teacher expertise with Vernier Lab Equipment. Expert teachers spent time developing technology-rich lab activities for students and training modules for teachers. Redesign of the Grade 10 Core French (FSF2D) course to integrate project-based assessment and more personalized learning activities. Development of blended learning materials for Grade 10 Careers (GLC2O) to allow for personalization of the curriculum. Development of integrated, cross-curricular projects for students in Grade 7 & 8. Visionary investigation and planning for an enhanced Grade 7 & 8 program. Teachers looked at the new classroom spaces that will be ready in September 2016 and how these can be used to provide Grade 7 & 8 students with age-appropriate and integrated learning opportunities. Having a week to work together and to focus exclusively on curriculum development was greatly appreciated by all participants. The school is fortunate to have the resources to provide these teachers some additional compensation for their efforts. This work also provided teachers with an excellent, job-embedded professional learning opportunity. 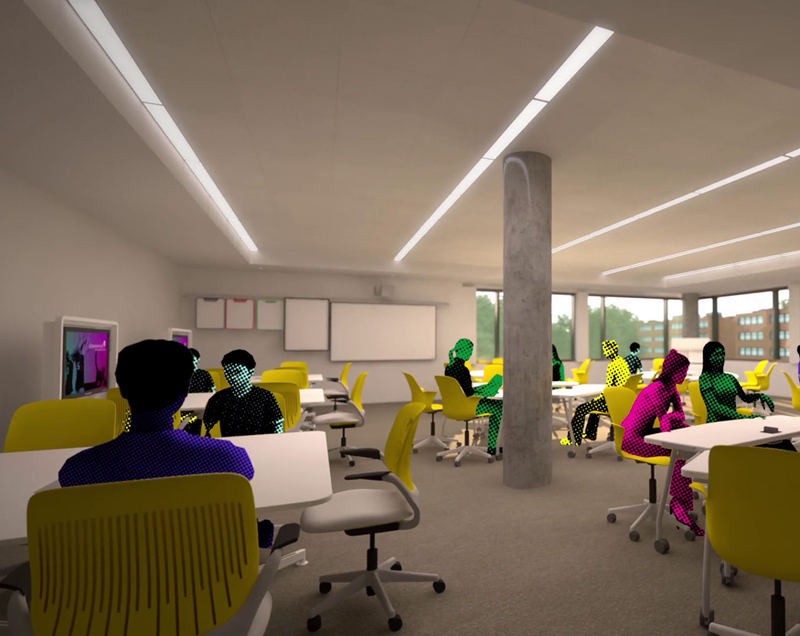 This work will support the transition in the fall of 2016 to the new learning spaces in our expanded campus and advance our ongoing, personalized learning initiatives. Throughout this school year, teachers who participated in our Summer Institute will use this blog to illustrate the impact of these new teaching approaches on student learning. During the second unit of the Careers course, students have been exploring the various options and opportunities for their postsecondary and future plans. Lesson themes have included occupations of interest, postsecondary options and programs, and varying types of career paths. Each student is investigating their own individual interests and establishing their own pathways. For some students it can be daunting to think about potential occupations at this stage of their lives, while others have a clear idea. Nevertheless, one of the main focuses of our unit was to allow students to recognize and appreciate that there are multiple paths one may take while determining and pursuing a career. To allow students to connect with the unit personally, they completed an exploration activity where they researched and created a presentation on an occupation of interest. Students then completed an interview task, in which they identified possible career paths that interested them and interviewed someone who has had experience in that particular field. Students found the task enlightening, as the interview often exposed more about the career than is found in research alone. Lastly, to provide students with an opportunity to learn about the various directions a career path can take, they participated in a live international discussion with Justin Lester, the current Deputy Mayor of Wellington, New Zealand. The students were provided with a brief overview of his career path to date and brainstormed questioned to ask him via Skype. The class found it quite astonishing to learn about the various studies, jobs and opportunities Justin had undertaken before becoming the youngest Deputy Mayor of New Zealand's capital city. Justin tried to impress on the students the importance of finding an occupation of interest and continually working toward achieving career goals. He concluded the discussion with an insightful message: to pursue direct and indirect opportunities that will act as stepping stones toward achieving a bigger goal. At Greenwood, we are constantly striving to better prepare our students for life beyond high school. Liz Branscombe, Greenwood's Guidance and Careers Subject Team Leader, talks about the new Grade 11 Adviser course, Advanced Learning Strategies (GLS4O), as a forum for students to develop their self-awareness and to focus on preparing themselves for this pivotal transition. The very nature of the course lends itself to personalized learning in very meaningful ways. To better prepare them to complete their postsecondary applications, students in this course are given opportunities to research and document information about various programs of interest. They are shown how to navigate through college and university websites in order to find program requirements, course descriptions and specifics for admission consideration. This process helps students to choose the appropriate Grade 12 courses with the help of their Adviser, who is also their Postsecondary Transition Counselor. The goal is that all Grade 11 students enrolled in GLS4O will have at least three programs that they have fully researched and to which they feel confident and excited about applying. Throughout the process, students are encouraged to reflect independently on postsecondary environments which will make them the happiest and the most successful. Postsecondary graduates are increasingly having difficulty finding jobs because of their lack of actual work experience. Preparing for the world of work is a topic of discussion for these students as many of our students strive to get some work experience before graduating. Opportunities are given for students to receive feedback on their resumes and also to practice for job interviews. Students learn the importance of networking, as well as identifying skills that are transferable to the world of work. Some attention is given to the impact of an online presence and students work to create personal websites, which may be used to represent them in the future. Planning out how they will check their progress. The students will spend significant time on their proposals for this project and teachers will ensure that these are aligned with their goals. The possibilities are endless, and I am excited to see what the students choose to accomplish! To hear what students say about Advanced Learning Strategies, check out the video below. Click here to read about a recent field trip to the Ontario Science Centre where GLS4O students explored the human brain and how we learn. We know why we are personalizing instruction - and we have learned a great deal about how to do so - but what does personalizing mean for the classroom teacher? I spoke with Tony Costa, Physical Education and Social Studies Teacher, and Amanda Smith, Instructional Leader for Math, about their recent experiences with personalizing. Both teachers have looked at their courses and made efforts to personalize instruction in an intentional way - but what they also realized is that they already personalize informally day to day. For example, Amanda will assign math problems and then instruct individual students on which questions they can skip, or which they should do, and who can use a calculator and who has to use mental math. She can do this in her small class of 11 students because she knows them and their readiness very well. Tony planned a Grade 8 unit where students could work at their own pace and in whatever sequence they chose. To do this he had to have all activities and resources ready ahead of time. What Tony found was that when students worked at their own pace he could not really anticipate what would come up in each class, and so his role changed to one of adviser as he directed students towards resources to answer their questions. He could make those resources appropriate to each student’s skill level. Amanda created a culminating activity for her Grade 12 Data Management course that was very open ended. Students could go in any direction to examine any topic as long as they included statistical analysis. Her role changed to advising students on how to find resources, work independently and develop an in-depth statistical research paper. Personalizing instruction requires a great deal of forward planning for teachers to ensure that the learning content, assignments, and assessments are all prepared ahead of time so that students really can be in control of their learning. It also requires a great deal of flexibility and agility to be able to respond to student needs so that all students are engaged and encouraged to reach their potential. What remains an area for examination is assessment. Teachers must make sure that assessment is fair and equitable and skills-based so that students who may be looking at different content - with differing levels of complexity based on readiness - are, in fact, being assessed by criterion-referenced standards that address course expectations.